Munster overran Sale in a frenetic and passionate clash at Thomond Park to top group one and book a last-eight spot in the Heineken Cup. The home side ran in first-half tries through Anthony Foley, Ian Dowling and Barry Murphy to lead 24-9 at the break. Sale stemmed the red tide for much of the second half but David Wallace added a fourth try for a bonus point late on. The English Premiership leaders had already qualified but Munster's win could book them a home quarter-final. Munster fly-half Ronan O'Gara slotted four conversions and a penalty, while Sale could only show three penalties from England stand-off Charlie Hodgson. 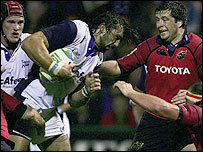 The victory was Munster's 28th consecutive home victory in Europe's premier club competition. Sale's problems began almost from the kick-off when Argentine lock Ignacio Fernandez Lobbe was sin-binned after an all-in brawl in the third minute. O'Gara slotted the three points, cancelled out shortly after by Hodgson, and Munster surged into the lead when skipper Foley burrowed over following a bullocking forward rumble. Fly-half O'Gara converted and Hodgson landed another penalty but Munster poured forward for a second try when wing Dowling dived over in the left corner to cap some silky running from the backs. The increasingly fractious encounter saw Marcus Horan from Munster and Sale's Chris Jones sin-binned around the half hour mark. But Munster maintained their momentum and romped further clear when Murphy plucked a deflected O'Gara kick from the air and carved his way 50 yards upfield to score, converted by the stand-off. O'Gara and Hodgson both missed late penalties but the Sale number 10 kicked three points deep into injury time to arrest the slide. The visitors increased their vigour in the second half but were unable to make any inroads as Munster's tenacity and professionalism shone through. And to the delight of the fervent home crowd, Wallace crossed on 80 minutes to gain the crucial bonus point. "The adrenaline was pumping and that's what keeps you going at times. It's such a great feeling to have achieved what we have. "Sometimes you get told you can't do certain things and it's good to achieve those things. We knew we'd left ourselves with a lot of work to do after the first group game. "We also realised from then on we were playing cup rugby and we couldn't afford to lose another game." "We played with lots of passion but made too many mistakes. "You need experience to play in these big Heineken Cup games. People have said we are favourites but I always believed we were outsiders. "We needed a perfect game to win here but didn't produce that. Munster deserved to win." Munster: Payne; Kelly, Murphy, Halstead, Dowling; O'Gara, Stringer; Horan, Flannery, Hayes; O'Callaghan, O'Connell; Leamy, Wallace, Foley. Replacements: Lawlor for Dowling (80), O'Leary for Stringer (80), Fogarty for Flannery (80), O'Driscoll for O'Connell (80), Pucciariello for Foley (40). Not Used: S Keogh, Connolly. Sale: Robinson; Cueto, Taylor, Seveali'i, Ripol; Hodgson, Martens; Sheridan, Titterrell, Turner; Fernandez Lobbe, Jones; White, Lund, Chabal. Replacements:Taione for Seveali'i (27), Wigglesworth for Martens (48), Titterrell for Bruno (61), Coutts for Stewart (65), Schofield for Lobbe (61), Mayor for C. Jones (71). Sin bin: Lobbe, C Jones (36).